Context: Perceived stress is higher for students in various healthcare courses. Previous studies have shown that pranayama practice is beneficial for combating stress and improve cardiovascular functions but both fast and slow pranayama practice produce different physiological responses. Aim: Present study was conducted to compare the effects of commonly practiced slow and fast pranayama on perceived stress and cardiovascular functions in young health-care students. Materials and Methods: Present study was carried out in Departments of Physiology and Advanced Centre for Yoga Therapy Education and Research, JIPMER, Pondicherry. Ninety subjects (age 18-25 years) were randomized to fast pranayama (Group 1), slow pranayama (Group 2) and control group (Group 3). Group 1 subjects practiced Kapalabhati, Bhastrika and Kukkuriya Pranayama while Group 2 subjects practiced Nadishodhana, Savitri and Pranav Paranayama. Supervised pranayama training was given for 30 min, 3 times a week for the duration of 12 weeks to Groups 1 and 2 subjects by certified yoga trainer. Following parameters were recorded at the baseline and after 12 weeks of training; perceived stress scale (PSS), heart rate (HR), respiratory rate, systolic blood pressure and diastolic blood pressure (DBP), mean arterial pressure (MAP), rate pressure product (RPP), and double product (Do P). Results: There was a significant decrease in PSS scores in both Group 1 and Group 2 subjects but percentage decrease was comparable in these groups. Significant decrease in HR, DBP, RPP, and Do P was seen in only Group 2 subjects. 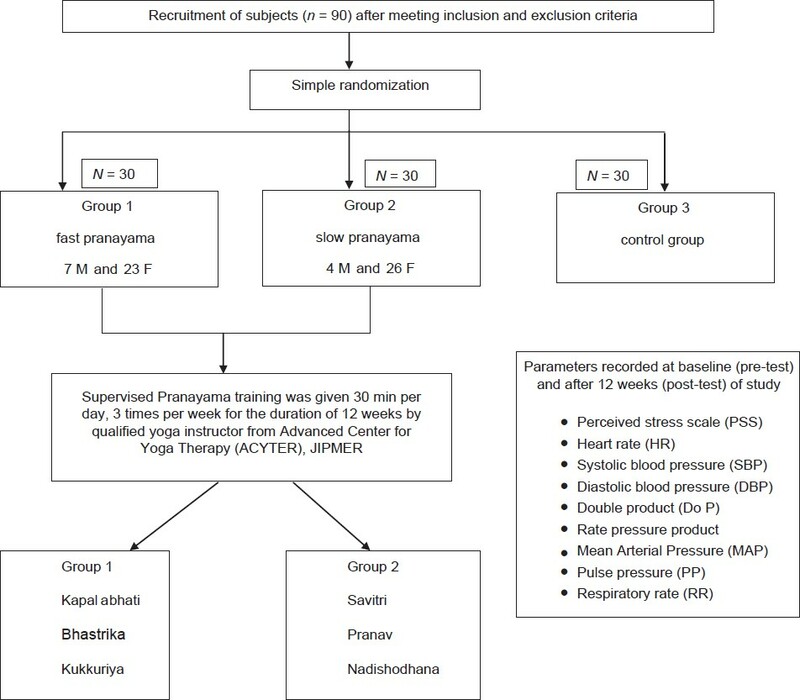 Conclusion: This study demonstrates that both types of pranayama practice are beneficial in reducing PSS in the healthy subjects but beneficial effect on cardiovascular parameters occurred only after practicing slow pranayama. Stress can be considered as a state of mental or emotional strain or tension resulting from adverse or demanding circumstances. Perceived stress has been reported higher for students in health-care courses including dental, medical, nursing, and graduate health-workers. ,,, Stress management programs for students including meditation, yoga, hypnosis, imagery, muscle relaxation etc., have shown improvement in their positive coping skills. Yoga is an ancient science, which originated in India and many studies have found that yoga and pranayama can be practiced to combat stress. Pranayama involves manipulation of the breath that is a dynamic bridge between the body and mind. Pranayama consists of three phases: "Puraka" (inhalation); "kumbhaka" (retention) and "rechaka" (exhalation) that can be either fast or slow. Pranayama has been assigned very important role in Ashtanga Yoga of Maharishi Patanjali and is said to be much more important than yogasanas for keeping sound health. Previous studies have shown that both fast and slow pranayamas are beneficial, ,, but they produce different physiological cardiovascular responses in healthy subjects. Slow pranayama like Nadishuddhi, Savitri and Pranav have been shown to decrease Heart rate (HR), systolic blood pressure (SBP), diastolic blood pressure (DBP), and increase pulse pressure (PP). , Very few references are available on the effect of practicing fast pranayamas. Few studies indicate that fast pranayamas like Kapalabhati and Bhastrika when practiced alone increases sympathetic activity , thereby, increasing HR, SBP, and DBP whereas, other studies showed that they decrease sympathetic activity and therefore, decrease HR, SBP and DBP. Other studies have found no effect of fast pranayama after 12 weeks of practice. Previous studies have shown that perceived stress negatively affects cardiovascular function by raising blood pressure (BP) and diminishing cardiovascular reactivity in the subjects. , To the best of our knowledge, there is no study comparing the cumulative effect of fast and slow types of pranayama on perceived stress and cardiovascular parameters in health-care students. Therefore, we have planned to compare three commonly practiced fast i.e., Kapalabhati, Bhastrika and Kukkuriya Pranayama and slow pranayama i.e., Nadishodhana, Savitri and Pranav on these parameters. Present study was conducted in the Departments of Physiology and Advanced Centre for Yoga Therapy Education and Research (ACYTER), JIPMER, Pondicherry. This study is a randomized control trial and prior permission for the study was taken from the institutional scientific advisory committee and human ethics committee. After taking written informed consent, 90 healthy subjects pursuing various health-care courses including medical, nursing, and allied medical sciences were recruited for the present study after meeting inclusion and exclusion criteria. Subjects aged between 18 years and 25 years of either gender. Subjects with history of previous or current organic diseases. Weight (in kg) (weighing machine supplied by Crown, New Delhi). After giving 10 min of supine rest to the subjects, brachial systolic (SBP) and DBP and HR were recorded on semi-automatic non-invasive BP monitor (CITIZENCH432B, Japan). 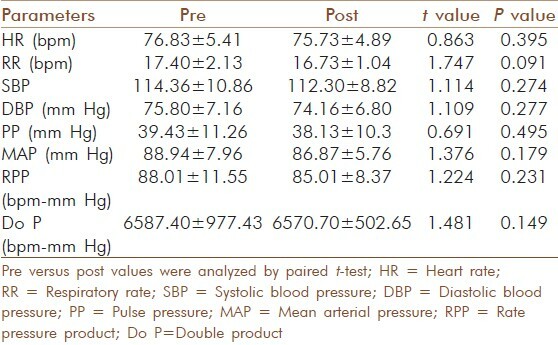 PP = SBP − DBP, mean arterial pressure (MAP = DBP + PP/3), rate pressure product (RPP = [HR × SBP]/100) and double product (Do P0 = HR × MAP) were calculated for each recording. Three BP and HR recordings at 1-min intervals were taken and the lowest of these values was included for the present study. All the subjects were then administered PSS. PSS is the most widely used psychological instrument for measuring the perception of stress. The questions in the PSS are of general nature, relatively free of content specific to any sub-population group and enquire about feelings and thoughts to measure the "degree to which situations in one's life is appraised as stressful" especially, over last 1 month. The items are easy to understand and response alternatives are simple to grasp. Items are designed to tap how unpredictable, uncontrollable, and overloaded respondents find their lives. It comprises of 10 items, four of which are reverse-scored, measured on a 5-point scale from 0 to 4. PSS scores are obtained by reversing responses (e.g., 0 = 4, 1 = 3, 2 = 2, 3 = 1 and 4 = 0) to the four positively stated items (items 4, 5, 7, and 8) and then summing across all scale items. Total score ranges from 0 to 40. Group 3 (n = 30): Control group. Subjects did not participate in any form of pranayama training. Subjects practiced pranayama in a quiet room maintained at comfortable temperature at 25 ± 2΀C. Supervised pranayama training to Group 1 and Group 2 subjects was given for 30 min a day, 3 times per week for the duration of 12 weeks in ACYTER by trained and certified yoga trainer. Before starting pranayama training, the yoga instructor gave 1 week of practice sessions to both Group 1 and 2 subjects to familiarize them with the techniques of pranayama. 1. Fast Pranayama: Each cycle (6 min) consisted of practicing 1 min of Kapalabhati, Bhastrika and Kukkriya pranayama interspersed with 1 min of rest between each pranayama. Subjects were asked to complete 3 or more cycles in each session. Kapalabhati Pranayama: The subjects were instructed to sit in Vajrasana and to forcefully expel all of the air from the lungs while pushing the abdominal diaphragm upwards. The expulsion is active but the inhalation is passive. Subjects rapidly breathed out actively and inhaled passively through both nostrils. One hundred and twenty rounds at a sitting was the maximum. It is considered an excellent rejuvenator of the respiratory system as all muscles of expiration are exercised. Bhastrika Pranayama: In this, emphasis is given to thoracic (not abdominal) breathing activity. Subjects were instructed to take deep inspiration followed by rapid expulsion of breath following one another in rapid succession. This is called as "bellow" type of breathing. Each round consisted of 10 such "bellows." After 10 expulsions, the final expulsion is followed by the deepest possible inhalation. Breath is suspended as long as it can be done with comfort. Deepest possible exhalation is done very slowly. This completes one round of Bhastrika. Kukkriya Pranayam: To perform this dog pant like breathing technique, the subject sat in Vajrasana with both palms on the ground in front with wrists touching knees and fingers pointing forward. The mouth was opened wide and the tongue pushed out as far as possible. They then breathed in and out at a rapid rate with their tongue hanging out of their mouth. After 10 or 15 rounds they relaxed back into Vajrasana. The whole practice was repeated for 3 rounds. 2. Slow pranayama: Each round (7 min) of session consisted of practicing 2 min of Nadishodhana, Pranava and Savitri pranayama interspersed with 1 min of rest between each pranayama done in comfortable posture (sukhasana). Subjects were asked to perform nine or more rounds according to their capacity. Nadishodhana Pranayama: This is slow, rhythmic, alternate nostril breathing. One round consisted of inhaling through one nostril, exhaling through other nostril and repeating the same procedure through other nostril. Savitri Pranayama is a slow, deep and rhythmic breathing, each cycle having a ratio of 2:1:2:1 between inspiration (purak), held-in breath (kumbhak), expiration (rechak), and held out breath (shunyak) phases of the respiratory cycle. Each lobular segment of the lungs was filled and a six count was used for inspiration and expiration, with a three count for the retained breaths (6 × 3 × 6 × 3). Pranava Pranayama is slow, deep and rhythmic breathing where emphasis is placed on making the sound AAA, UUU and MMM while breathing out for duration of 2 to 3 times the duration of the inhaled breath. It is a four part technique consisting of Adham Pranayama (lower chest breathing with the sound of AAA), Madhyam Pranayama (mid-chest breathing with the sound of UUU), Adhyam Pranayama (upper chest breathing with the sound of MMM) and then the union of the earlier three parts in a complete yogic breath known as Mahat Yoga Pranayama with the sound of AAA, UUU and MMM. At the end of session, all Group 1 and 2 subjects were instructed to lie down in shavasana and relax for 10 min. Control Group: They did not practice any pranayama during the study period. All the parameters were again recorded after 12 weeks of intervention and data was statistically analyzed. For each group, mean and standard deviation of the scores were calculated. Analysis of the data was done using SPSS version 13 and normality testing of data was done by Kolmogorov-Smirrnov test. Power and Sample size software version 3.0 was used to calculate adequate sample size (at assumed power of 0.9) required for the study and to analyze post-test power of the study. Intergroup mean differences in age, anthropometric, physiological parameters and PSS were measured by using one way ANOVA and post-hoc analysis was done by Tukeys-Krammer test. For intra-group comparisons of parameters, paired t-test was used for parametric and Wilcoxon signed rank test for non-parametric parameter. Chi-square test was used to compare intergroup gender distribution. P value less than 0.05 was considered as statistically significant. [Table 1] demonstrates that there was no significant difference in one way ANOVA test for intergroup comparison of age, height and weight distribution amongst three groups. Similarly, there was no significant difference in gender distribution amongst three groups when analyzed by Chi-square test. 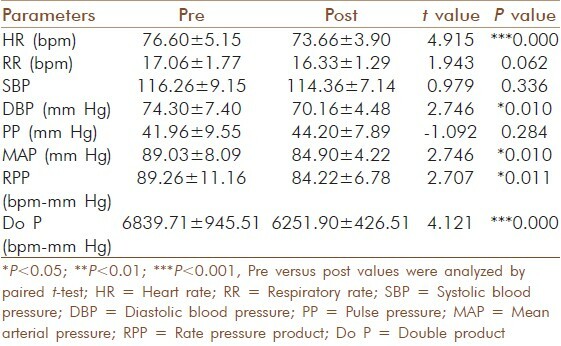 [Table 2] shows that there was no significant difference in one way ANOVA test for the comparison of baseline values of all the tested cardiovascular parameters and PSS scores amongst the three groups and post- hoc analysis between these groups done by Tukey-Krammer test was also insignificant. [Table 3] shows that there was significant reduction in PSS score in Group 1 and Group 2 subjects ( P = 0.000) after 12 weeks of intervention (post-test) when compared to pre-test score (baseline value). However, no longitudinal change occurred in PSS score in Group 3 subjects. [Table 4] shows that there was no significant longitudinal change in post-test values in all the tested cardiovascular parameters in Group 1 subjects. [Table 5] shows there was significant decrease in HR ( P = 0.000), DBP ( P = 0.01), MAP ( P = 0.01) RPP ( P = 0.01) and Do P (P = 0.000) in Group 2 subjects after 12 weeks (post-test values) of intervention when compared to baseline values. [Table 6] shows there was no significant change in all the tested parameters at post-test level when compared to baseline (pre-test) values in Group 3 subjects. [Figure 1] depicts the flow chart of protocol carried out during the study. On post-test analysis, the power of study with the mean PSS difference of 4.67 and SD of 4.5 is 0.99 which shows sample size was adequate and strength of the study is good. We observed no significant difference in the baseline parameters of three groups and therefore, they can be considered comparable for the study. After 12 weeks of study period, we observed a significant decrease in DBP, HR, MAP, RPP, and Do P in only slow pranayama group (Group 2) with no change in control group (Group 3). However, trend towards insignificant decrease in SBP (2%), DBP (1.63%), MAP (1.74%) and RPP (1.93%) was seen in fast pranayama group (Group 1). Similar results were observed in previous studies which found significant decrease in BP and HR with the practice of Savitri Pranayama. Resting HR is mainly determined by parasympathetic nervous system (PNS) and DBP is a function of peripheral vascular resistance (PVR) which is mainly determined by sympathetic nervous system (SNS). MAP is determined by both SNS and PNS and refers to the mean pressure throughout the cardiac cycle. Decrease in HR, DBP, and MAP represents increase in parasympathetic and decrease in sympathetic activity in slow pranayama group. Non-significant increase in PP (15.23%) was observed in slow pranayama group and no change was observed in other groups. Rise in PP represents better tissue perfusion. RPP and Do P represent sympathetic activity and are indirect measures of O 2 consumption of heart or work load on heart. ,,, Rise in PP with decreased RPP indicates that the tissue perfusion is increased with decreased work load on heart in slow pranayama group. Therefore, our study demonstrates that decrease in sympathetic activity and increase in parasympathetic activity and thereby, improvement of autonomic tone towards parasympatho-dominance was seen in both fast and slow pranayama groups but statistically significant change in measured physiological parameters was seen in only slow pranayama group. We observed significant reduction in PSS scores in both fast and slow pranayama groups. Therefore, both types of pranayama practice were equally effective in reducing perceived stress in both Group 1 and Group 2 subjects. Reduction in stress may have occurred due to better autonomic tone (higher parasympathetic and lesser sympathetic tone) observed in Group 1 and 2 subjects and reduced stress may have resulted in improved cardiovascular functions in the slow and fast pranayama groups. To summarize, our study demonstrates that both types of pranayama practice are equally effective in reducing perceived stress but significant benefit on physiological parameters is seen in only subjects practicing slow pranayama. Since the results on perceived stress are comparable, slow pranayamas can be given to subjects in all age groups (both young and old) whereas fast pranayamas are more suitable for subjects with stable cardiovascular function. On post-test analysis, sample size (power = 0.99) was found adequate for the present study. In the present study, it was not possible to attempt double blind conditions. Only single composite questionnaire was used to measure perceived stress. Future studies should include biochemical parameters such as vanillylmandelic acid, metanephrines along with other personality scales, which could be related to stress levels. Therefore, the results can be considered to be preliminary and be viewed with caution of potential rater bias. No significant clinical side-effects (confusion, cardiovascular accidents, dyspnea etc.) occurred with pranayama practice during the study period. The authors thank Sri G Dayanidy, yoga instructor ACYTER for giving pranayama training to the subjects. Authors feel deep gratitude for all the subjects who volunteered for the present study. We also thank Director JIPMER and Director Morarji Desai National Institute of Yoga, New Delhi for their support. 1. Birks Y, McKendree J, Watt I. Emotional intelligence and perceived stress in healthcare students: A multi-institutional, multi-professional survey. BMC Med Educ 2009;9:61. 2. Shapiro SL, Shapiro DE, Schwartz GE. Stress management in medical education: A review of the literature. Acad Med 2000;75:748-59. 3. Pau A, Rowland ML, Naidoo S, AbdulKadir R, Makrynika E, Moraru R, et al. Emotional intelligence and perceived stress in dental undergraduates: A multinational survey. J Dent Educ 2007;71:197-204. 4. Jones MC, Johnston DW. Distress, stress and coping in first-year student nurses. J Adv Nurs 1997;26:475-82. 5. Gopal A, Mondal S, Gandhi A, Arora S, Bhattacharjee J. Effect of integrated yoga practices on immune responses in examination stress-A preliminary study. Int J Yoga 2011;4:26-32. 6. Bijlani RL. Understanding medical physiology. 3 rd ed. New Delhi: Jaypee Brothers; 2004. p. 871-910. 7. Chodinzki JY. The effect of rhythmic breathing on blood pressure in hypertensive adults. J Undergrad Res 2000;1-6. 8. Veerabhadrappa SG, Baljoshi VS, Khanapure S, Herur A, Patil S, Ankad RB, et al. Effect of yogic bellows on cardiovascular autonomic reactivity. J Cardiovasc Dis Res 2011;2:223-7. 9. Telles S, Raghuraj P, Arankalle D, Naveen KV. Immediate effect of high-frequency yoga breathing on attention. Indian J Med Sci 2008;62:20-2. 10. Udupa K, Madanmohan, Bhavanani AB, Vijayalakshmi P, Krishnamurthy N. Effect of pranayam training on cardiac function in normal young volunteers. Indian J Physiol Pharmacol 2003;47:27-33. 11. Bhavanani AB, Madanmohan, Udupa K. Acute effect of Mukh bhastrika (a yogic bellows type breathing) on reaction time. Indian J Physiol Pharmacol 2003;47:297-300. 12. Madanmohan, Udupa K, Bhavanani AB, Vijayalakshmi P, Surendiran A. Effect of slow and fast pranayams on reaction time and cardiorespiratory variables. Indian J Physiol Pharmacol 2005;49:313-8. 13. Singh S, Gaurav V, Parkash V. Effects of a 6-week nadi-shodhana pranayama training on cardio-pulmonary parameters. Journal of Physical Education and Sports Management 2011;2:44-7. 14. Subbalakshmi NK, Saxena SK, Urmimala, D'Souza UJ. Immediate effect of "Nadi-shodhana Pranayama" on some selected parameters of cardiovascular, pulmonary, and higher functions of brain. Thai J Physiological Sci 2005;18:10-6. 15. Raghuraj P, Ramakrishnan AG, Nagendra HR, Telles S. Effect of two selected yogic breathing techniques of heart rate variability. Indian J Physiol Pharmacol 1998;42:467-72. 16. Pal GK, Velkumary S, Madanmohan. Effect of short-term practice of breathing exercises on autonomic functions in normal human volunteers. Indian J Med Res 2004;120:115-21. 17. Allen MT, Bocek CM, Burch AE. Gender differences and the relationships of perceived background stress and psychological distress with cardiovascular responses to laboratory stressors. Int J Psychophysiol 2011;81:209-17. 18. 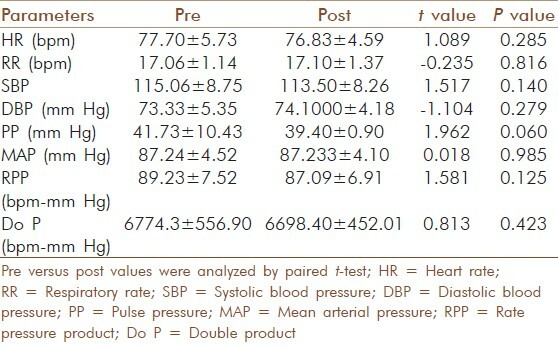 Suter PM, Maire R, Holtz D, Vetter W. Relationship between self-perceived stress and blood pressure. J Hum Hypertens 1997;11:171-6. 19. Cohen S. Perceived stress in a probability sample of United States. In: Spacapan Shirlynn, Oskamp Stuart, editors. The social psychology of health. The Claremont Symposium on Applied Social Psychology. Thousand Oaks, CA, US: Sage Publications; 1988. p. 31-67. 20. Gitananda Giri Swami. Pranayama: The Fourth Limb of Ashtanga Yoga. Pondicherry, India: Satya press; 2008. 21. Hainsworth R. Circulatory responses from lung inflation in anesthetized dogs. Am J Physiol 1974; 226:247-55. 22. Willam F Ganong. Cardiovascular regulatory mechanisms. Review of Medical Physiology. 22 nd ed. Singapore: The McGraw-Hill Companies; 2005. p. 597-610. 23. Kitamura K, Jorgensen CR, Gobel FL, Taylor HL, Wang Y. Hemodynamic correlates of myocardial oxygen consumption during upright exercise. J Appl Physiol 1972;32:516-22. 24. Hermida RC, Fernández JR, Ayala DE, Mojón A, Alonso I, Smolensky M. Circadian rhythm of double (rate-pressure) product in healthy normotensive young subjects. Chronobiol Int 2001;18:475-89. 25. Holmberg S, Serzysko W, Varnauskas E. Coronary circulation during heavy exercise in control subjects and patients with coronary heart disease. Acta Med Scand 1971;190:465-80. 26. Madanmohan, Udupa K, Bhavanani AB, Shatapathy CC, Sahai A. Modulation of cardiovascular response to exercise by yoga training. Indian J Physiol Pharmacol 2004;48:461-5. 27. Jerath R, Edry JW, Barnes VA, Jerath V. Physiology of long pranayamic breathing: Neural respiratory elements may provide a mechanism that explains how slow deep breathing shifts the autonomic nervous system. Med Hypotheses 2006;67:566-71. 28. Schelegle ES. Functional morphology and physiology of slowly adapting pulmonary stretch receptors. Anat Rec A Discov Mol Cell Evol Biol 2003;270:11-6. 29. Kullok S, Mayer C, Backon J, Kullok J. Interactions between non-symmetric mechanical vector forces in the body and the autonomic nervous system: Basic requirements for any mechanical technique to engender long-term improvements in autonomic function as well as in the functional efficiency of the respiratory, cardiovascular, and brain systems. Med Hypotheses 1990;31:91-7. 30. Joseph CN, Porta C, Casucci G, Casiraghi N, Maffeis M, Rossi M, et al. Slow breathing improves arterial baroreflex sensitivity and decreases blood pressure in essential hypertension. Hypertension 2005;46:714-8. 31. Tzeng YC, Larsen PD, Galletly DC. Cardioventilatory coupling in resting human subjects. Exp Physiol 2003;88:775-82.